Howell, Jude Shang, Xiaoyuan and Fisher, Karen R. 2019. NGOs and Accountability in China. p. 33. He, Yanling 2019. The Palgrave Handbook of Local Governance in Contemporary China. p. 383. Gül, Volkan 2019. Representation in Minipublics. Representation, p. 1. He, Baogang 2019. The Palgrave Handbook of Local Governance in Contemporary China. p. 347. Tong, Dezhi and He, Baogang 2018. How democratic are Chinese grassroots deliberations? An empirical study of 393 deliberation experiments in China. Japanese Journal of Political Science, Vol. 19, Issue. 4, p. 630. Zhang, Kaiping and Meng, Tianguang 2018. Political elites in deliberative democracy: beliefs and behaviors of Chinese officials. Japanese Journal of Political Science, Vol. 19, Issue. 4, p. 643. Mah, Daphne Ngar-yin Lam, Victor Siu, Alice Ye, Hua Ogata, Seiichi and Wu, Yun-Ying 2018. Understanding undergraduate students’ perceptions of dynamic pricing policies: An exploratory study of two pilot deliberative pollings (DPs) in Guangzhou, China and Kyoto, Japan. Journal of Cleaner Production, Vol. 202, Issue. , p. 160. MALESKY, EDMUND and TAUSSIG, MARKUS 2018. Participation, Government Legitimacy, and Regulatory Compliance in Emerging Economies: A Firm-Level Field Experiment in Vietnam. American Political Science Review, p. 1. PAN, JENNIFER and CHEN, KAIPING 2018. Concealing Corruption: How Chinese Officials Distort Upward Reporting of Online Grievances. American Political Science Review, Vol. 112, Issue. 03, p. 602. Xu, Ping Ye, Yinjiao and Zhang, Mingxin 2018. Assessing political participation on the Internet in contemporary China. Chinese Journal of Communication, Vol. 11, Issue. 3, p. 243. Gastil, John 2018. The Lessons and Limitations of Experiments in Democratic Deliberation. Annual Review of Law and Social Science, Vol. 14, Issue. 1, p. 271. He, Baogang and Wagenaar, Hendrik 2018. Authoritarian deliberation revisited. Japanese Journal of Political Science, Vol. 19, Issue. 4, p. 622. Pei, Zhijun Pan, Yingchun and Skitmore, Martin 2018. 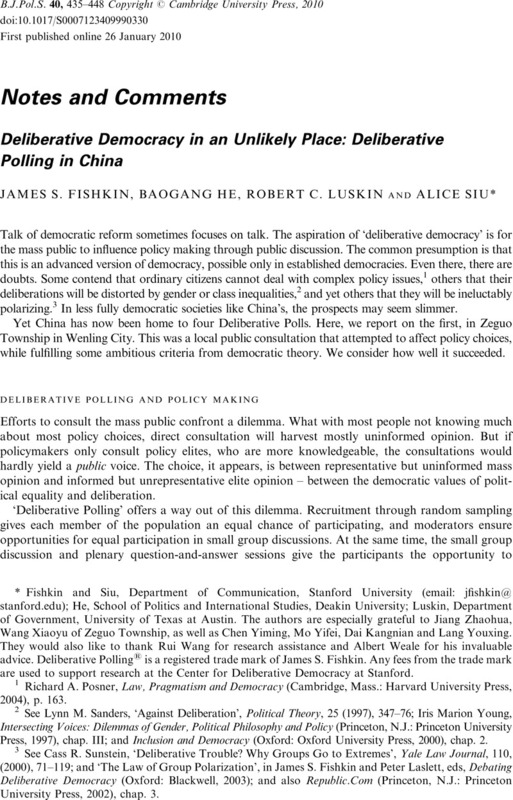 Political Efficacy, Social Network and Involvement in Public Deliberation in Rural China. Social Indicators Research, Vol. 139, Issue. 2, p. 453. Gerber, Marlène Bächtiger, André Shikano, Susumu Reber, Simon and Rohr, Samuel 2018. Deliberative Abilities and Influence in a Transnational Deliberative Poll (EuroPolis). British Journal of Political Science, Vol. 48, Issue. 04, p. 1093. He, Baogang 2018. Deliberative citizenship and deliberative governance: a case study of one deliberative experimental in China. Citizenship Studies, Vol. 22, Issue. 3, p. 294. Qin, Xuan and He, Baogang 2018. Deliberation, demobilization, and limited empowerment: a survey study on participatory pricing in China. Japanese Journal of Political Science, Vol. 19, Issue. 4, p. 694. Weymouth, Robert and Hartz-Karp, Janette 2018. Principles for Integrating the Implementation of the Sustainable Development Goals in Cities. Urban Science, Vol. 2, Issue. 3, p. 77. Tang, Beibei 2018. Deliberation and governance in Chinese middle-class neighborhoods. Japanese Journal of Political Science, Vol. 19, Issue. 4, p. 663. Gerschewski, Johannes 2018. Legitimacy in Autocracies: Oxymoron or Essential Feature?. Perspectives on Politics, Vol. 16, Issue. 3, p. 652. 1 Posner, Richard A., Law, Pragmatism and Democracy (Cambridge, Mass. : Harvard University Press, 2004), p. 163. 2 See Sanders, Lynn M., ‘Against Deliberation’, Political Theory, 25 (1997), 347–376; Marion Young, Iris, Intersecting Voices: Dilemmas of Gender, Political Philosophy and Policy (Princeton, N.J.: Princeton University Press, 1997), chap. III; and Inclusion and Democracy (Oxford: Oxford University Press, 2000), chap. 2. 3 See Sunstein, Cass R., ‘Deliberative Trouble? Why Groups Go to Extremes’, Yale Law Journal, 110 (2000), 71–119; and ‘The Law of Group Polarization’, in James S. Fishkin and Peter Laslett, eds, Debating Deliberative Democracy (Oxford: Blackwell, 2003); and also Republic.Com (Princeton, N.J.: Princeton University Press, 2002), chap. 3. 4 Zhongzhao, Peng, Lan, Xue and Ke, Kan, Public Hearing System in China (Beijing: Qinghua University Press, 2004). 5 He, Baogang, Rural Democracy in China (NY: Palgrave, 2007), chap. 6. 6 He, Baogang, ‘The Theory and Practice of Chinese Grassroots Governance: Five Models’, Japanese Journal of Political Science, 4, no. 2 (2003), 293–314. 7 Unger, Jonathan and Chan, Anita, ‘The Internal Politics of an Urban Chinese Work Community: A Case Study of Employee Influence on Decision-making at a State-Owned Factory’, The China Journal, No. 52, July, 2004), pp.1–24. 8 See the official document, Democratic Sincerely Talk: The Innovation from Wenling (compiled by the Department of Propaganda, Wenling, 2003), p. 98. 9 Mang, Zhu, Multiple Dimensions of Administrative Law (Beijing: Beijing University Press, 2004). Chap. 1 is devoted to the topic of public hearings on administrative punishment. 10 Quansheng, Wang, A Study of Legislative Hearing (Beijing: Beijing University Press, 2003). 11 Their speeches at the international conference on public hearings in China, 2005. See Shengyong, Chen and He, Baogang, eds, Development of Deliberative Democracy (Beijing: China’s Social Sciences Press, 2006), pp. 445 and 449. 12 Chen, and He, , eds, Development of Deliberative Democracy, Appendix. The appendix includes a summary of the international conference on public hearings held July 2005. 13 For more on the rationale for deliberative polling, see Fishkin, James S. and Luskin, Robert C., ‘Experimenting with a Democratic Ideal: Deliberative Polling and Public Opinion’, Acta Politica, 40 (2005), 284–298. 14 They were paid 50 Chinese yuan (RMB) each, equivalent at the time to around US $6. 15 A few participants were excluded from the analysis because they appeared to be cases in which the designated participant sent a family member or friend in his or her stead. 16 Almost two-thirds of the participants but just over 80 per cent of the non-participants were male. The participants averaged 47.5 years old, the non-participants 37.6 years old. Only about 20 per cent of the participants but more than 50 per cent of the non-participants had at least a high school education. More than 60 per cent of the participants but only about 20 per cent of the non-participants were farmers. Only 16.5 per cent of the participants but 52.2 per cent of the non-participants were entrepreneurs. 17 See Mill, J. S., Considerations on Representative Government (New York: Prometheus Books, 1991), especially chaps 1 and 8, pp. 78–9 and 171–3. See also Mansbridge, Jane, ‘On the Idea that Participation Makes Better Citizens’, in Stephen L. Elkin and Karol Edward Soltan, eds, Citizen Competence and Democratic Institutions (University Park, Pa.: Penn State University Press, 1999), pp. 291–325. 18 Sanders, , ‘Against Deliberation’; and Young, ‘Intersecting Voices’. 19 For concerns about the inequalities in the current public hearing system, see Chen, and He, , eds, Development of Deliberative Democracy, pp. 445 and 449. 20 See Sunstein, , ‘Deliberative Trouble?’ and ‘The Law of Group Polarization’, in Fishkin and Laslett, eds, Debating Deliberative Democracy. 21 See, for example, Luskin, Robert C., Fishkin, James S. and Jowell, Roger, ‘Considered Opinions: Deliberative Polling in Britain’, British Journal of Political Science, 32 (2002), 455–487. 22 See Sunstein, Cass R., Infotopia: How Many Minds Produce Knowledge (Oxford: Oxford University Press, 2006), especially chap. 2; and Schkade, David, Sunstein, Cass R. and Hastie, Reid, ‘What Happened on Deliberation Day?’, California Law Review, 95 (2007), 915–940. 23 Luskin, et al. , ‘Considered Opinions’, p. 477. 24 Luskin, Robert C., ‘True Versus Measured Information Gain’ (Department of Government, University of Texas, Austin), also available at http://cdd.stanford.edu/research/papers/2001/true-infogain.pdf, summarized in Luskin, et al. , ‘Considered Opinions’, pp. 480–483. 25 All the variables are implicitly subscripted for the ith participant and jth project index. 26 See Luskin, et al. , ‘Considered Opinions’, pp. 480–481, and Luskin, , ‘True versus Measured Information Gain’. 27 Just as in Luskin, et al. , ‘Considered Opinions’. Results available on request. 28 These criteria date from the 16th National Congress in 2002 and were reaffirmed in the 17th. See Mingai, Zhang, ‘Congress Mapped Out China’s Democratic Politics’, China Elections, http://en.chinaelections.org/newsinfo.asp?newsid=11877 (accessed 26 July 2008). 29 Jiang, Zaohua and He, Baogang, ‘Deliberative Democracy: The Participatory Decision-making Mechanism’, in Chen and He, eds, Development of Deliberative Democracy, pp. 227–228. 30 Personal communication to the authors. 31 French, Howard W., ‘China’s new frontiers: Tests of democracy and dissent’, New York Times, 19 June 2005. 32 See He, Baogang and Yuhua, Xie, ‘Participation at Workplace: A Case Study of Deliberative Forum in Longbiao Company’, Twentieth-First Century (Hong Kong), No. 4, (2008), 102–112. 33 Ogden notes the importance of ‘deliberation in the Chinese political system as a means of reaching consensus’ and argues that this deliberation ‘could prove to be an important building block for democratization’ (Ogden, Suzanne, Inklings of Democracy in China (Cambridge, Mass. : Harvard University Press, 2002), p. 257). Professor Lin Shangli, the dean of social sciences at Fudan University, argues for deliberation-led democratization (see Shangli, Lin, ‘Deliberative Politics: A Reflection on the Democratic Development of China’, Academic Monthly (Shanghai), No. 4 (2003), 19–25). On this issue, see Leib, Ethan and He, Baogang, eds, The Search for Deliberative Democracy in China (New York: Palgrave, 2006). * Fishkin and Siu, Department of Communication, Stanford University (email: jfishkin@stanford.edu); He, School of Politics and International Studies, Deakin University; Luskin, Department of Government, University of Texas at Austin. The authors are especially grateful to Jiang Zhaohua, Wang Xiaoyu of Zeguo Township, as well as Chen Yiming, Mo Yifei, Dai Kangnian and Lang Youxing. They would also like to thank Rui Wang for research assistance and Albert Weale for his invaluable advice. Deliberative Polling® is a registered trade mark of James S. Fishkin. Any fees from the trade mark are used to support research at the Center for Deliberative Democracy at Stanford.